DIEGO COSTA: What do you think of his form? Jose Mourinho has challenged Diego Costa to improve his condition as soon as possible and in return, he should be able to find his goalscoring touch. Having scored just two goals in the last seven games, I am wondering what you think of Costa's recent form? We are all aware of the injury problems the Spanish international faced last season that plagued the end to his season. This time around, Costa has had similar issues to deal with and Mourinho believes these are affecting his ability to get on the score sheet more often. 'For me, the problem is not the goals - they will come as a consequence of his condition. He has to improve his condition. He was injured and had many doubts because he went a long time without training. Obviously that must have an effect on a player in the way he runs, the way he moves and in his co-ordination. Without doubt, coming back from an injury such as Costa's, it must have a slight effect on his game in those first few matches after making his return to action. I personally think his movement has been good and he looks to be OK. Many times of late you have seen him sprint to close someone down and it hasn't looked like it has an adverse affect on him. If anything, it's players not finding him in the final third the way they had been doing at the start of the season that has been the problem of late. I have noticed that we are beginning to see Costa express his frustrations at times when the ball is not passed to him in and around the box. So to sum up, I personally am happy with Costa's form as although it's only two goals in seven, he still works his arse off for the team and that's good enough for me. 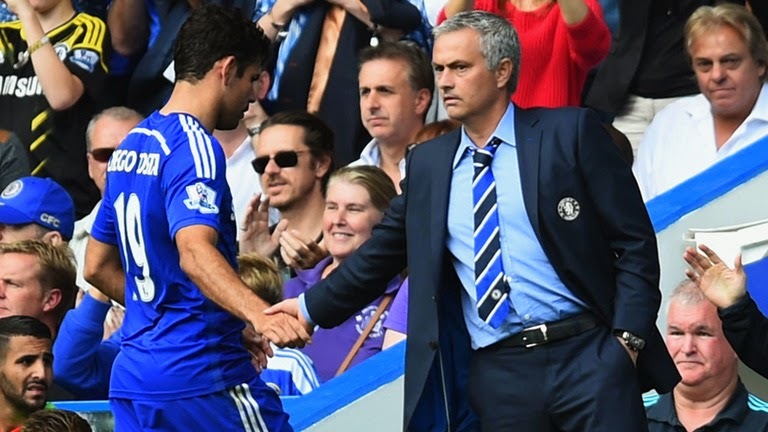 What do you think of what Mourinho has said and of Costa's form?